If you’ve ever had shin splints, you’ll know just how frustrating the mysterious pain can be. What are shin splints, and how can runners avoid or treat them? Find out here. Ask two different runners what kind of pain they feel from shin splints, where the pain originates, and where it hurts, and you’ll get two different answers. There are a number of possible explanations for shin splints, and runners could feel the pain and soreness in the tibia (shinbone), knee, in the soft tissue around the tibia, or down towards the top of the foot. Why Do We Feel Pain From Shin Splints? Experts agree that shin splints are either caused by damage to the bone, or by problems with the muscle or surrounding connective tissue. Most shin splint injuries can be traced back to the shinbone itself. As runners, we put a lot of stress on our shinbones and the muscles and tendons which support them. Stress injuries to the shinbone can soon lead to a stress fracture unless treated properly. A much smaller number of shin splint injuries can be put down to the muscles of the shin (tibialis anterior) and its tendons. What Can Be The Cause Of Shin Splints? 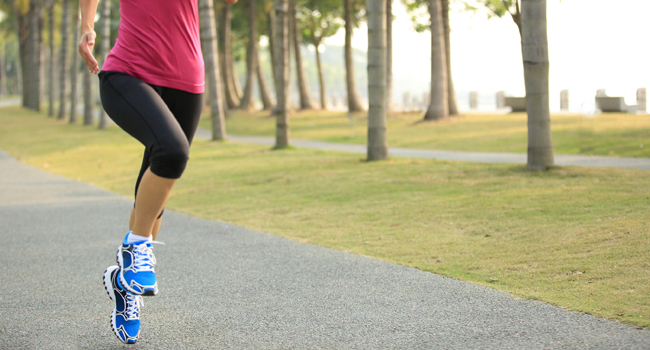 For runners, there are probably four root causes of shin splint injuries. But the good news is, they can all be avoided or corrected. If you’re an underpronator (supinator), your feet will roll outwards when you stride. This places additional stress on the mechanics of the lower leg, which could lead to shin splints. If you suddenly up your mileage, or embark on a long distance running programme, the muscles and tendons of your shins may struggle to keep up, leading to over-use injuries… including shin splints. Hard surfaces (particularly concrete), uneven off road terrain, and running on a camber can all contribute to shin splints. Vary the surface you run on, try to avoid cambered surfaces, and be aware of changing off road surfaces during hot Summer months. There’s plenty you can do to ward off shin splints. Add these to your running routine to keep your shins, calves and ankles happy. Use a physio ball, foam roller or regular tennis/golf ball to gently roll out the sole and arches of your feet. Stretch your calves and soleus regularly. Walk barefoot as often as you can. Adding strength training to your exercise routine will definitely help your biomechanics. Squats, lunges, glute work and core strength work will all keep the biomechanics of your lower body in better alignment. Rest up and take a break from running. Gently foam roll your calves and shins. Roll your feet on a hard ball. Ice the area, and elevate your legs for 15-20 minutes at a time. And if the problem persists, see a specialist like a physiotherapist to get to the root of the problem… and get you up and running again very soon.